CTA Tools A308 Offset Valve Tappet Gauge Set is designed for use when setting valve tappets and makes valve lash adjustment easy. The CTA Tools Offset Valve Tappet Gauge Set features 2-Handles and 11-Blades. Easy to use simply insert the proper offset blade on the CTA Tools Offset Valve Tappet Gauge Set to adjust intake and exhaust settings. 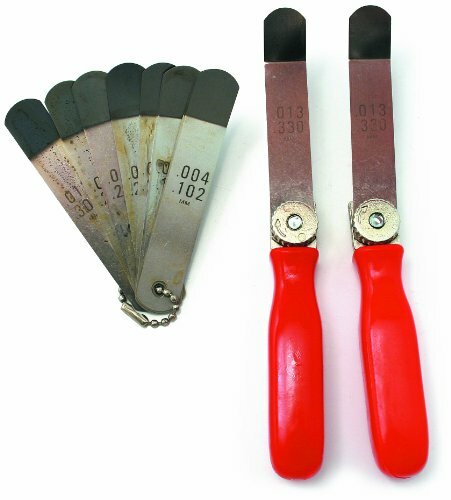 The blades insert into the handle easily and all blades come with metric markings on all 11 sizes, ranging from 0.004 to 0.014-" . Whether tuning up your ‘68 Corvette or changing the oil on a John Deere tractor, CTA can supply you with the tools needed to do the job. California Prop 65 - Warning, This product contains chemicals known to the State of California to cause cancer, birth defects or other reproductive harm. When you need to quickly and easily measure gap widths, use the ABN Thickness Gauge. You can use this handy master tool on anything from guitars to engines, metal to glass, and everything in between. 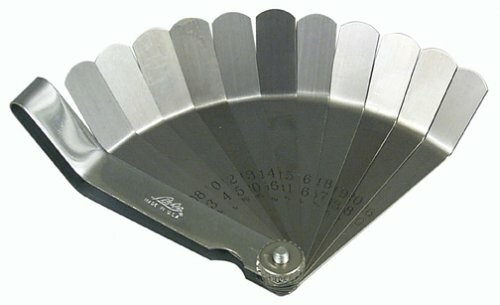 This gauge is constructed with 16 tempered steel blade leaves ranging from 0.005 inch to 0.020 inch and 0.127mm and 0.508mm and can be stacked to achieve increased gap measurements. Each blade has the sizes laser etched for easy identification and a measurement that is true to the label. The blades are bound within a blade protector to prevent loss of individual blades and are designed with a thumb notch for easy selection, easy use, and easy return. WARNING: This product can expose you to chemicals which is [are] known to the State of California to cause cancer and birth defects or other reproductive harm. For more information go to www.P65Warnings.ca.gov. 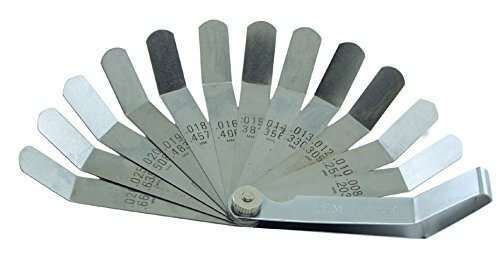 The OEMTOOLS 12 Blade Valve Tappet Feeler Gauge features hardened and tempered steel blades that are laser etched with inches and millimeters. The 12 offset 30 degree blades are 4 Inch long and measure 0.008 Inch (0.203 mm) to 0.26 Inch (0.660 mm). Its blade protector has thumb notch to aid Inch blade removal. 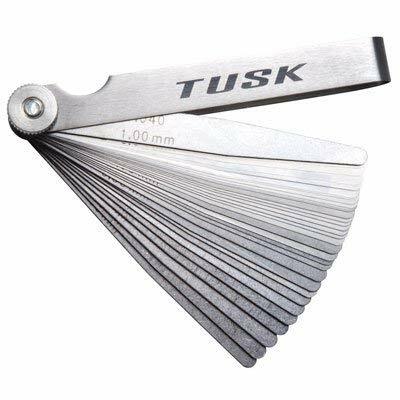 The Tusk Feeler Gauge Set is a 32 blade tapered feeler gauge set with both metric and inch readings. The tapered end works well with those hard to get to valve tappets and buckets on performance motorcycles, ATV's, and UTV's. Each gauge measures 95mm in length. 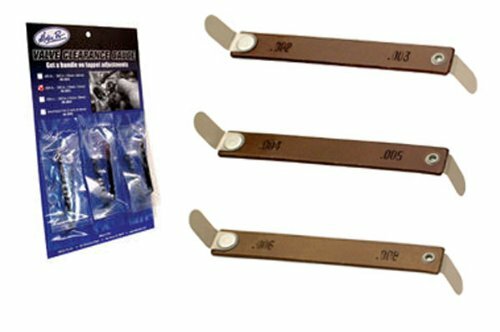 This precision feeler gauge set includes sizes from 0.001"/0.03mm to 0.040"/1mm. Think Tusk for all of your motorcycle, ATV, and UTV valve adjustment needs. Includes the following gauge sizes: 0.001"/0.03mm, .0015"/0.04mm, .002"/0.05mm, .0025"/0.06mm, .0028"/0.07mm, .003"/0.08mm, .0035"/0.09mm, .004"/0.10mm, .005"/0.13mm, .006"/0.15mm, .007"/0.18mm, .008"/0.20mm, .009"/0.23mm, .010"/0.25mm, .011"/0.28mm, .012"/0.30mm, .013"/0.33mm, .014"/0.35mm, .015"/0.38mm, .016"/0.40mm, .018"/0.45mm, .020"/0.50mm, .022"/0.55mm, .024"/0.60mm, .025"/0.63mm, .026"/0.65mm, .028"/0.70mm, .030"/0.75mm, .032"/0.80mm, .034"/0.85mm, .035"/0.90mm, and .040"/1.00mm. Precision blades are offset at the proper angle for adjustment of valve tappets. Blades are approximately 1/2 inch wide by 4 inch long. 11 offset steel blades. 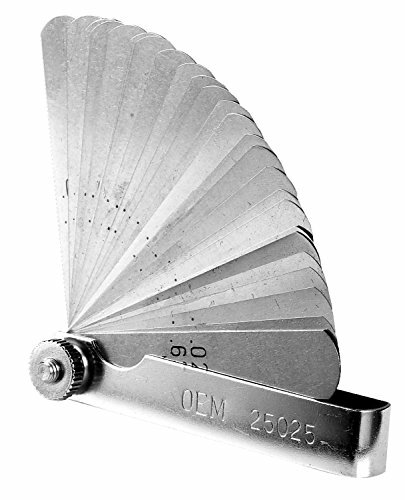 This OEMTOOLS 26 Blade Master Feeler Gauge is perfect for measuring gap widths and other vital measurements. Each blade has been laser etched with SAE and Metric sizes and constructed by hardened, tempered steel. 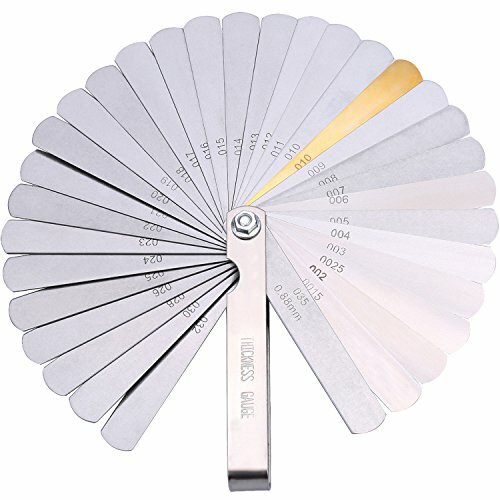 This OEMTOOLS Feeler Gauge also features a thumb notch for easy blade removal. Stanley J000R Proto 16 Blade Overhead Valve Feeler Gauge Set 1/2-inch wide bent gauges for setting overhead valves. Sizes: .009-inch, .010-inch, .011-inch, .014-inch, .015-inch, .016-inch, .017-inch, .018-inch, .019-inch, .020-inch, .021-inch, .023-inch, .024-inch .025-inch .026-inch, .027-inch. Blades are offset at a right angle to help protect hands from a hot manifold while setting an overhead value. Blades etched with both decimal size and metric equivalent. 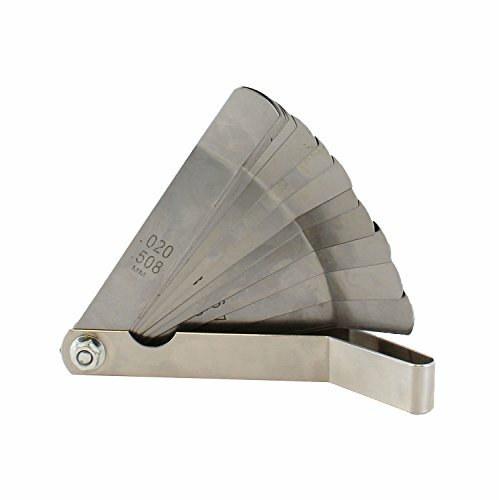 Looking for more Valve Tappet Feeler Gauge similar ideas? Try to explore these searches: Wedding Photo Cards, 3/4 Sleeve Animal, and Abyssinian Oil. Look at latest related video about Valve Tappet Feeler Gauge. Shopwizion.com is the smartest way for online shopping: compare prices of leading online shops for best deals around the web. 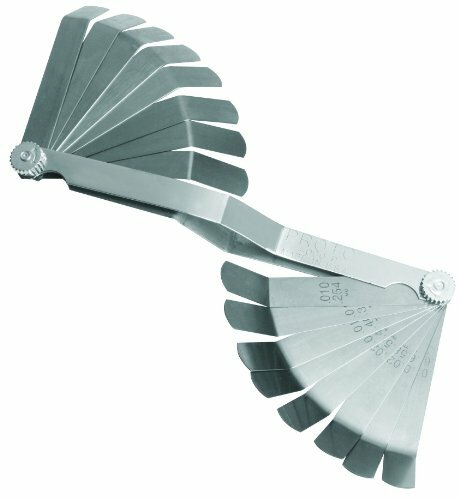 Don't miss TOP Valve Tappet Feeler Gauge deals, updated daily.